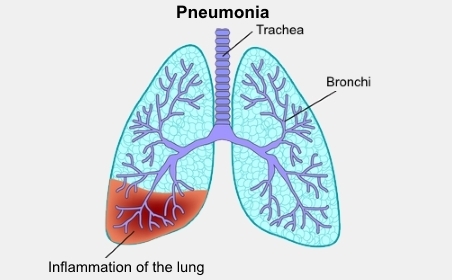 Pneumonia is a chest infection that people of all ages can get. It can be serious, and sometimes life-threatening. Older people and people with poor health or lung disease tend to get it more often. It is also usually worse in these people. You get pneumonia by breathing in bacteria, viruses or other germs, which then infect your lungs. The air sacs at the end of your small airways, called alveoli, and the surrounding lung tissue become inflamed. They can then fill with infected fluid, which makes it hard to breathe. Usually pneumonia is caused by bacteria, which means you need to take antibiotics to treat it. If you have pneumonia it can make you quite sick. Older people might not have a fever or any specific symptoms, but you might notice that they are confused or agitated. If you or someone with you has these symptoms, is confused, and is also very short of breath or has blue lips or fingers, see a doctor immediately. On the next page: How is pneumonia treated?